This past weekend we went shopping. Yes, we even braved two stores during Black Friday! Kohl's department store was our first stop. Kohl's ranks high on my list of favorite stores partly because it based in Menomonee Falls, Wisconsin. Max Kohl opened his first department store in 1962 in Brookfield, Wisconsin (the Kohl family operated grocery stores before the department stores). Kohl's is now one of the largest discount department store chains in the United States, operating 1,059 stores in 49 states. However the main reason I love Kohl's is because I can find quality merchandise at reasonable prices for everyone in the family all in one store. We shop there for clothes, shoes and for items for our home. We even registered at Kohl's before our wedding. This weekend we took advantage of the great holiday sales and purchased Christmas dress clothes for both of my children, a king-size sheet set, a rug for my kitchen, a new coat for myself, and some clothes for my husband. 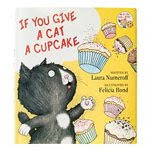 Kohl's Cares for Kids® "If You Give a Cat a Cupcake" Book ($5) - this book by best-selling author Laura Numeroff is a bargain at $5. Plus 100% of the profit from Kohl's Cares for Kids products go directly to support children’s health and education initiatives. A win-win situation all around and I applaud Kohl's for supporting the nation's youth! While this isn't on their gift guide, like I said before I always buy my kids' Holiday clothes from Kohl's. In the store they have a huge selection of gorgeous dresses and I bought a cute sweater vest outfit for my son. Kohl's also offers a surprisingly large selection of TOYS and GAMES. Mudd® Fringe Scarf ($17.00) - This multi-color funky scarf would make a cool gift for a teen girl. Source Striped Shirt ($19.00) - Several great looking dressy shirts available at Kohl's, perfect for guys. axcess Geometric Fleece Pajama Set for her ($19.99) - I'm all for warm and cozy! 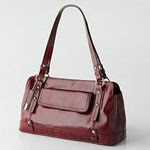 Relic® Regina Faux-Leather Shoulder Bag ($22.00) - This looks like a cute, small and functional bag and it comes in three colors. Croft & Barrow® 1/4-Zip Microfleece Sweatshirt for him ($12.99) - My husband would live in Microfleece if he could get away with it! Today Kohl's began their 25 DEALS OF CHRISTMAS. I'm looking forward to checking out their newest deal everyday. And, here's some exciting news! Thanks to Kohl's, one Brimful Curiosities reader will win a $50 Kohl's giftcard! To enter, leave a comment describing one gift you plan to give this holiday season. • Contest ends on Monday, December 14th, 2009 at 11:59 PM CST. 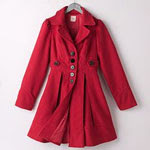 1st extra entry: Visit the Kohl's Holiday Gift Guide and leave a comment with the name of one of your picks from the guide. Fun! I loved Kohl's for maternity clothes (not technically maternity clothes - just long inexpensive shirts). I'm giving a lot of books as gifts this year to the kids in our extended family. Wow, that is a big gift guide. My son has and loves the crayola telescoping holder with 150 crayons. My sons and I are giving my parents a stepping stone for their garden that has the boys' footprints and some pretty tile mosaic decorations. I'm giving my hubby one of those Keurig single cup coffee makers and an assortment of coffees. YUM! From the Kohls gift guide I'd love to have a new knife block like this one: Chicago Cutlery® Insignia2® 18-pc. Knife Block Set. I love the 50$ BLack Nine and Co handbag that has now on sale for 25$!!!! This year I plan on going simple and inexpensive. I'll probably gift a lot of books and smallish knickknacks that remind me of the person. One gift I'm planning on buying is cute PJ's for one of my girls. I subscribe by RSS. Thanks for the chance to win! I love shopping at Kohl's! Like you said, they have quality merchandise at great prices! I follow you on Twitter, too... and I re-tweeted about this giveaway. I checked out the gift guide... and that espresso maker looks pretty cool! I plan to give my in-laws gift cards. From Kohl's holiday gift guide, I like the nerf mini sports pack. I plan to give my father a watercolor painting of his dog, who died last year. And from the Kohl's guide, I love the Sonoma flannel PJ sets. I am giving my mom a pandora bracelet this year. I am buying my parents and my inlaws gift cards for a "date night." They deserve a little night out on the town! I think the DXG All Weather Camcorder is very cool. 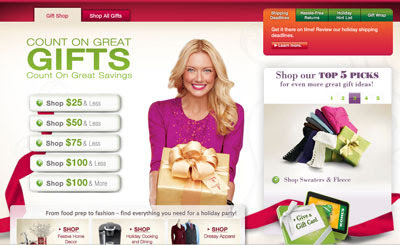 Oh I like the Chaps Cable-Knit cardigan in the Kohl's gift guide (in classic purple!). I'd pick this for myself! I'm going to get my husband a leather jacket. He's been wanting one for years!! Oh wow. My boys would love the Discover Kids Camera! So cute. I like the Tonka Classics Fire Truck from the gift guide for my son! Ohhh, please enter me here! One gift I intend to give this year . . . books!!! But, then again, my son is adamant he wants a skateboard. Not sure about that one while he is still so young! I subscribe too by the way! I follow on Twitter and just RT'd! Thanks again! I love Kohl's! This year I am hoping to get both my boys Buzz Lightyear pajamas for the night before Christmas. I am planning to give a lot of books this year for Christmas. snagged the electric griddle on BF at Kohls that I plan to give away at a Christmas gift exchange. LOVE Kohls! My pick from the guide is the BEST pick - a Kohl's Gift Card! :) That aside, my pick would be some of that Calphalon cookware! Thank you1 We are "planning" on getting a Wii game this year at least that was on the list last week. Man, 6 year olds are finiky. From the Kohls gift guide, I would get ..."Legos Pirate, the Kraken Attacken"... we are huge lego fans. I plan to give my kids more Legos since there doesn't seem to be enough for all of them! There are many gifts that I would love to give to people, but one in particular is to my cousin's new girlfriend...She likes to bake, so we made her a fun little gift basket with Christmas themed sprinkles, cookie cutters, dish towel and Betty Crocker cookie magazine. I looked through the gift guide and I would definitely choose the Candie's Microsuede Boot Slippers for my sister who LOVES anything boots(she get's that from me LOL). Love Kohls. One item my son is getting is a Cookie Monster sweatshirt that I bought him at Kohls. He is going to love it. Thanks for the fun. One of my favorite picks from their list is the Keurig Mini Brewer. My daughter wants the LPS Adotion center this year so I am getting her that! I want Chaps cable-knit sweater so cute! I got my sister a cd and movie she wanted. I am getting my boys a ton of Legos to get us through the winter months. I would pick the Keurig for my parents. Tough decision! I believe I would most like to try the Jensen® Wall Mountable MP3 CD System with Digital Tuner. I'm giving Hubby a wood splitter so he doesn't have to rent one every weekend anymore. I am dreaming of a pair of these nightstands for our bedroom at The Stone House. I want to get a set of wine glasses for my in laws new condo! I am giving my granddaughter her first bike. I follow you via Feed Burner. Great giveaway - I love Kohls! My family shops at Kohl's all the time. Looking at robes and PJ's, on some Christmas wishlists this year. I am giving my daughter some fun paint brushes and paints and stampers. I like the franklin nhl mini hockey set from the gift guide. I like the Croft and Barrow Hooded Tweed Coat! I love the Croft and Barrow Hooded wool coat! I plan to buy a winter coat for my grandchildren. I'll be getting CDs for the hubby this year, since they are the only thing he really wants. From the gift guide, I'd love to get the axcess Plaid Fleece PJ Set! I'm getting my daughter an iPod docking station. I'm giving a GPS to my mother in law. I like Cuisinart Grind 'N Brew 12-Cup Automatic Coffee Maker! This would be great for DH. I'm getting my tween the Mudd fringe scarf. I'm also getting my hubby a digital photography book. I'm taking the kids to BuildABear to make a bear for their great-grandma. I am giving my oldest daughter some accessories for a classroom since she will be done her student teaching in 2 weeks and will then be looking for a teaching job. Its been really fun buying little things to put together for her! From the gift guide...the hopscotch rug. My daycare kids would LOVE it!! I plan to get my husband some new slippers. I plan to give my daughter the book Purplicious! I actually bought the mini Kuerig for my parents Christmas present at Kohl's! My girls would luv the Rock Tumbler Classic! Shining up their own finds would be such fun for them! I follow you on Twitter as Coupons4Me and here's my Tweet.. I'm getting my sister a digital camera and Teach her how to use it so she can start capturing memories of her own! At Khols I love the Apt. 9 Argyle Cashmere Sweater! The Chaps Floral and Scroll nightgown is also beautiful. I'm making up a little basket of etsy bath products for my mom. I plan to give my wife some new running shoes. Thanks! I'm giving a gift certificate to design your own clothes to my 11-year-old sister. Exciting! I'm planning on getting my husband a new Drill/Driver for Christmas. We are getting my son a road map rug and a set of cars for Christmas. Thanks for the giveaway. I would like Vera Wang Pajamas. I got my 3-year-old and 6-year-old matching princess tents. They sometimes get annoyed with the other one and I can never tell them both to go to their rooms to cool off since they share a room, so I thought it would be nice for them to each have their own space to go to. I am giving my son a Wii. I also want to get my sister stretchy pants shes 4 months prego. I saved for months so I could get my seven year old a DS and a couple of games for Christmas. I'm giving my mom a new set of bowls for her kitchen. It's what she wants! I would really like to get my husband an X-Box 360 ..that is really what he wants! lol We will see! I pick the Sharper Image® Digital Photo Viewer from the guide! My husband has been wanting one! I love kohls! I plan to buy a george foreman grill for my brother-in-law. He just got his first apartment. I am giving appliqued hand towels. I plan to give my granddaughter an MP3 player. Oh- I like the 10K White Gold 1/4-ct TW Black & White Diamond Infinity Earrings!